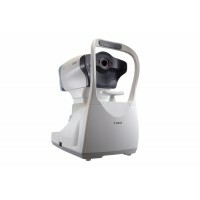 Not only the usual refractometry and keratometry, but also corneal diameter and base curve of contact lens can be measured with this one instrument. Thus, measurements of eye and prescriptions for glasses and contact lenses can be made more efficiently. VRK-2400 provides an extensive range of dioptric measurement range. It covers -25D to +22D, and the radius of curvature for keratometry is 5.0mm to 10.2mm. Owing to its easy alignment and friendly operation you can measure the refraction and keratometry in a sequency, the results can be checked all at once. 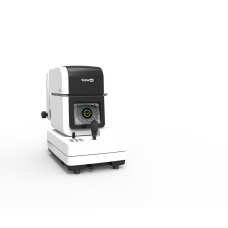 Using the VRK-2400's Freeze Function, you can measure the diameter of the cornea, pupil or hard contact lenses worn by process is both easier and more precise. A wide visual field angled color picture notice table makes easy to fix patients' eye through making patients confortable. An auto cloud and mist function is helpful t ochildren or damaged eyes because it affects to machinery near vision and patients control. It can measure and indicate pupils' distance can be measured automatically by using measurement of reflection eyes. If VRK-2400 not used over 5 minutes, it shut off from electric power saving function eliminates current to the TV monitor and lighting circuitry. It conserves energy and prevents any build-up of heat from electronic circuitry, increasing its useful life. CLBS supports easy to measure posterior curve of hard contact lens. VRK-2400 provides intuitive user interface and it contains a fixed gripe of stage and a power sign light. It can be measured by only one hand. Even novices can use it with precise results. Through monitor, you can see the results(maximum of 10 data for each eye) of measurements stored in memory. Built-in printer provides fast and perfect clear paper that is placed VRK-2400's front-right side. measured data an be delivered to the external instrument (PC, phoropter) through RS-232. VGA Video Output: Connected with Monitor via VGA Cable. RS-232 Interface Connected with PC or PAV-6100 via RS232 Cable. USB B Type Connected with PC via USB Cable. Canon Full Auto Ref-KeratometerThe RK-F2 automatically aligns, acquires the readings and then moves ..